Well, I'm aboard a train right now, writing this update to the site for lack of something better to do, on the back of an unused worksheet from my CELTA English lesson on Friday. Me and Jeff are returning to Seoul without Milly. She's going to Busan on a bus. This update is going to be a synopsis of the Boryeong Mud Festival, as well as a review. We took a 14,900-won-per-person train from Yongsan in Seoul to Daecheon Station. Before boarding the train, we went to a Kimbap Cheonguk and ordered ojingeodeopbap and kimbap with kimchi and tuna in it. Then we got onto the train and realized we'd bought "ipseok" tickets that require you to stand, or if you're sitting, yield your seat to someone with a reservation. We spent the next few hours hopping from seat to seat, and hanging out around the lavatory. We tried to reserve with "Coconuts Hotel" over another passenger's phone, but they didn't allow phone reservations and said their one empty room would be gone by 5:00. There was a woman who was going to move to the US next week, and said I could sit in her seat if I talked to her daughter in English, so I did. Her daughter paid me in dry squid. We got off the train and onto a bus bound for Daecheon Beach. It was miserable and we had to stand the whole way as the bus crawled its way through extremely heavy Boryeong Mud Festival traffic. Irritated and hot, we decided to just get off the bus and walk. It was a wise decision, as we very soon found a minbak to stay at: Seongjin Minbak. It wasn't much. For a whopping 80,000 won, we got a room with that typical Korean yellow linoleum floor and no beds. Fortunately, mats were furnished for sleeping on the floor. There was a fan and a small color TV, but the bathroom was shared and had no hot water. However, there was a public cooking facility. The lock on our door didn't work, so the ajeosshi came to fix it, while Milly was changing. I said "she is changing!" but he kept on trying to open the door to "test" it. I said "I SAID, SHE IS CHANGING." The dirty old man continued. Finally, the ajumma started yelling at the ajeosshi, and he stopped. 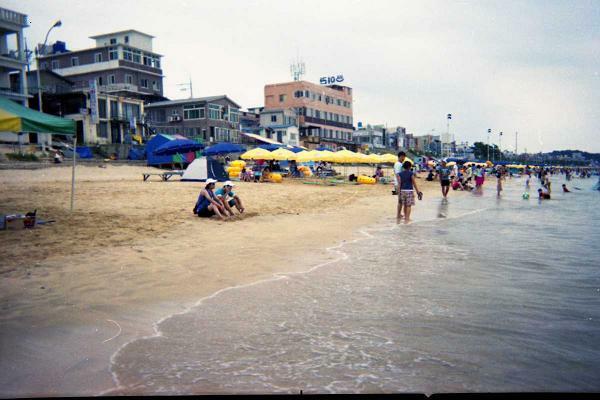 We went to the beach, and Jeff and Milly got some cans of Hite beer, and we enjoyed the warm weather in our bathing suits -- I had just bought mine for 8,000 won (an ordinary, western-style pair of shorts for swimming, not a thong). Milly and I went swimming for a while in the ocean, which was my first swim in over a year, and went bathing in Boryeong mud water in a makeshift pool. I got mud in the ears and couldn't hear well for a while. We went and hung out on the beach again. We walked around for a while and then, thanks to my Korean skills, made some quick friends with Korean tourists (from Seoul). WE drank many pitchers of Hite beer, and had some makgeolli as well. I did "ssireum" with one of the guys (wrestling). In ssireum, you grab the opponent's waist and try to pin him, I believe. I wasn't really sure how to play. He threw me on the ground, but I managed to flip us over so he was underneath -- I counted to five. Apparently that meant I won. Of course, I probably just made a dirty move and he was too much of a good sport to mention it. I doubt I'm that much of a ssireum protegy. In any case, the fly on my pants was destroyed and I had to use a safety pin instead (gift from Milly). Our group continued drinking until me and a girl from Shinchon got nice and cozy. I wonder where that will lead. We went back to the minbak and slept (sans the drunk Shinchon girl). I woke up at about 11:00 AM and realized that I needed to turn in some SDV 100 class assignments online by 2:00 PM, or I'd fail the course. I visited three different PC bangs -- each one was either an empty building, or closed. Finally, PC bang #4 proved to be a real one, so I prepaid two hours for 3,000 won and got my assignments in on-time. I tried to get back to Seongjin Minbak by 2:00 PM to meet Jeff and Milly, but lost my way so I walked into a police station and asked for directions. They put me in a squad car and drove me to the minbak. That was nice of them. Milly had to go to Busan for personal reasons, so we said good-bye. She got a bus ticket and boarded, leaving me and Jeff to debate over when to return home. I got overpriced yukgaejang for 5,000 won, and he had some doenjang jjigae, and then it started raining and became apparent that going home was the best choice. I walked along the beach and got a few pictures, then we caught a bus to the train station. Some annoying western guys were trying to flirt with some Korean girls, and kept shouting and even took out a beer bong and made use of it. Guys like them give guys like me a bad name. Finally, we boarded the train, where I am now. It was a fun weekend and a cheap getaway. I bet I spent less than $100. However, the mud element seems merely a gimmick. 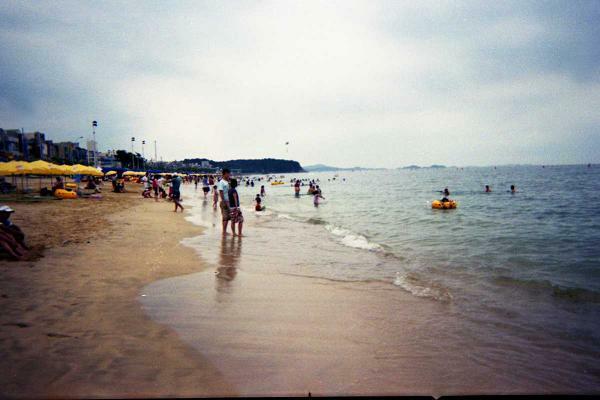 In the future, I will probably just go to Incheon's beaches instead. 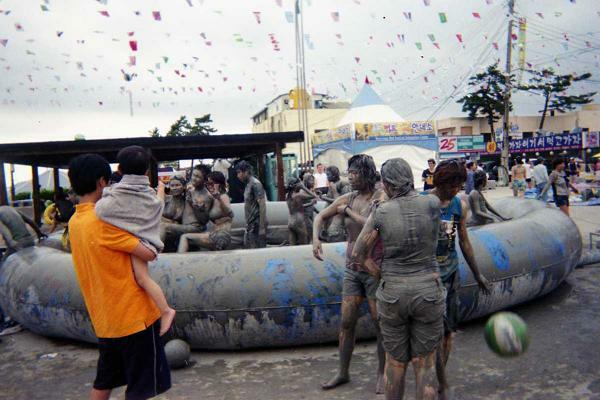 Nevertheless, the Boryeong Mud Festival was an enjoyable trip. Retrospectively, I must've been pretty drunk to make out with that girl.